Majority of the time, I have smoked salmon from Russ & Daughters and berries - plus Sullivan Bread's Filone bread. 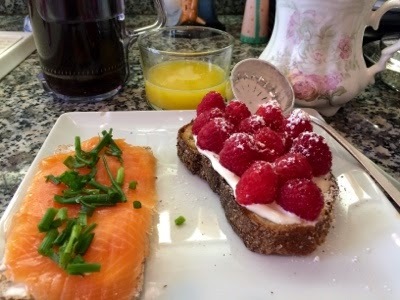 On WASA Norwegian bread, I spread a tablespoon of organic cream cheese, 2 slices of smoked salmon and chives on top and if I have capers, some capers. I toast a slice of Sullivan Bread's Filone bread and spread some mascarpone on it; arrange the raspberries on top and using a sugar sprinkler, shake some confectioner's sugar on the raspberries. I always have a small cup of whisked matcha tea, a cup of fresh green tea, and 1 or 2 cups of espresso or cappuccino and about 3oz of grapefruit juice for my 2 vitamin pills with this. Variation to my normal breakfast of smoked salmon is using omelette instead of cream cheese. This is my energy breakfast most of the time.